Conserving Priceless Chinese Paintings Is An Art All Its Own The U.S. has one of the world's best collections of Chinese paintings, but only four master conservators who know how to take care of them — and they're all approaching retirement. At the Freer and Sackler Galleries in D.C., Xiangmei Gu is passing her skills on to a new generation. Outside of China and Taiwan, U.S. museums hold the world's best collection of Chinese paintings. It's worth billions of dollars, but it's also fragile: Over time, these paintings fall apart. In the U.S., there are only four master conservators who know how to take care of them, and they're all approaching retirement. The Freer and Sackler Galleries — one of the huge, stone Smithsonian buildings on the National Mall in Washington, D.C. — employ one of those masters. Inside the gallery, there's a softly-lit room with a high ceiling. To the right there's a painting that's about 4 feet long. 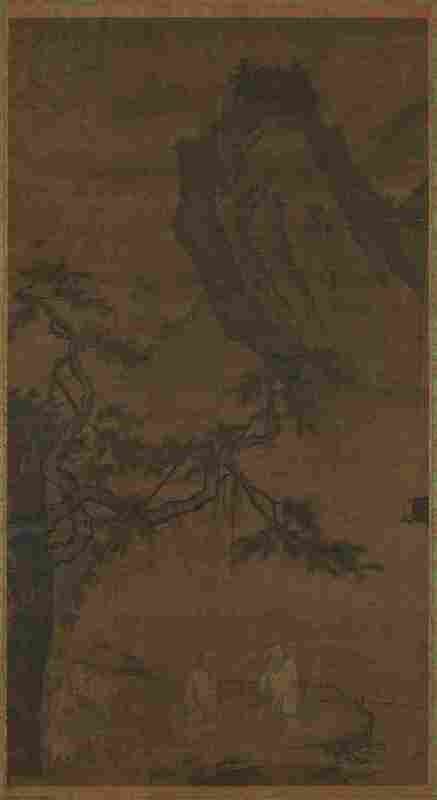 In it, two Chinese scholars dressed in long robes stand under a gnarled tree. There's a river and a soaring mountain range in the background. It's called Summoning The Sage At Wei River and it's from the Ming Dynasty, making it about 500 years old. "The lighting in the museum gallery is very good, because it also helps to mask a lot of the damages," says Grace Jan, an assistant conservator at the gallery. "You can see there [are] horizontal lines that are slightly darker, and then you can see there's like kind of a vertical line down the center above the figure on the left." She says that the faint black streak was once much more serious damage. These paintings weren't done with oil paints on wooden panels, like the Mona Lisa; they were painted on fragile pieces of silk or rice paper, which is why Chinese painting conservation is so important. Summoning The Sage At Wei River had to be carefully cleaned and painted over. "We just do as minimal treatment as we can so that it doesn't jump at you when you're looking at the painting," Jan says. She points to an example on the Wei River painting. I can barely see it, but that's the point. The Freer has more than 2,000 Chinese paintings and master conservator Xiangmei Gu is responsible for maintaining all of them. One of the first things she shows me is an ancient map that was torn halfway down the middle. She says once she remounted it, it looked fine, and she's right: Standing just inches away, I can't see where the tear used to be. It took Gu a long time to learn how to do that. She started at the Shanghai Museum as an apprentice to the resident master there in the 1970s. For 15 years, she learned how to repair and remount ancient paintings and calligraphy. In 1987, she came to the U.S. to join her husband, and three years later, she got a job at the Freer. "I worked so many years, almost 40 years," she says, "[I] still never finished; [I] continue to learn this job." That's right, 40 years and she says she's still learning. Still, she can't work forever. 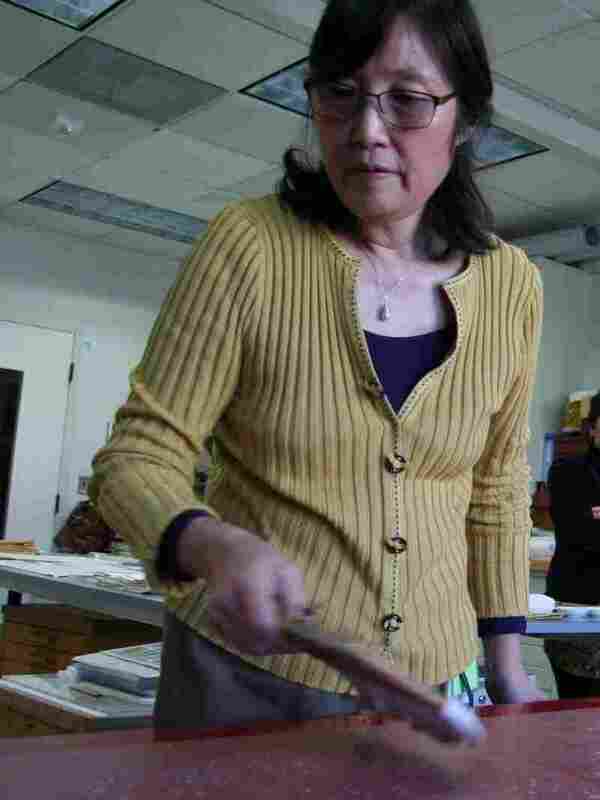 The Mellon Foundation recently gave the Freer a million-dollar grant to train an assistant Chinese painting conservator. In the meantime, Gu is passing her skills on to Jan. Jan has a master's degree in conservation from New York University, and she got interested in the practice because her grandfather was also a painter. "I remember seeing his paintings turning yellow," Jan says. "They turned yellow after they were mounted, in the next couple years." Conservator Xiangmei Gu works at a red lacquer table in the gallery's conservation lab. This is typical of xuan paper, the rice paper used in Chinese paintings, which is one reason why they need such special care. Here's another big reason: Chinese paintings are made to be handled. Andrew Hare, an East Asian painting conservator at the Freer, explains: "To appreciate a Chinese painting, you would have to, for example, unroll a scroll, and roll it back up. If it were an album, you'd have to open, turn the pages. And of course when you use something over time, there's wear and tear and damage." Conserving these fragile works starts with making new backing paper. Gu and Jan demonstrate on a giant red lacquer table. Gu rolls out the paper and brushes it to make it perfectly smooth. She says they can't afford even the slightest crease on this paper. Hare explains why: "What you do now is maybe part of the art object for the next several hundred years, so this is the only time you have — right now — to get it right." Gu spreads a layer of glue, picks out all the dust and bits of dirt, and lays the next piece of paper, then brushes it again to make it smooth. Now she's stuck two layers together, which is good for a hanging scroll — the albums that hold some Chinese paintings need seven. This is pretty basic, but conservators-in-training practice for months with newspaper before they can use the actual rice paper. Jan says without spending the decades it takes to learn these skills, conservators wouldn't dream of fixing an ancient masterpiece. "It's like just, you know, sticking a Band-Aid on something and calling it done. That's not the most effective way to treat our priceless works of art in the United States." 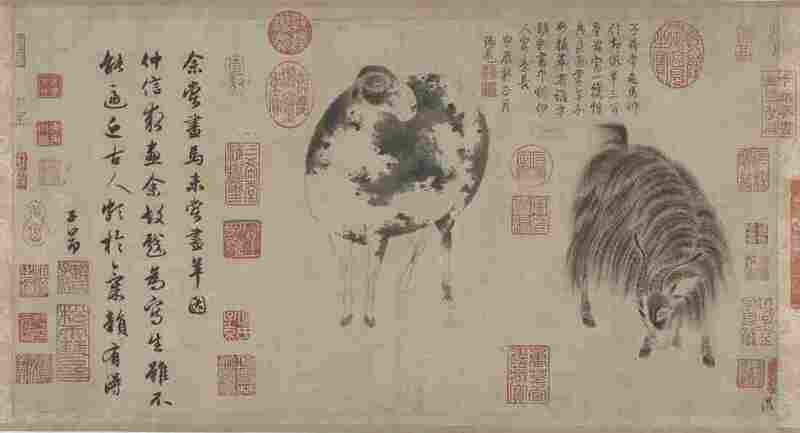 For example, the Freer has a scroll — Sheep And Goat by Zhao Mengfu — that's estimated to be worth $100 million, if it were ever sold, according to Arnold Chang, a specialist who directed the Chinese painting department at Sotheby's for more than a decade. Jan says she plans to dedicate the rest of her life to preserving these treasures.